Let me just say this up front: I love my job! Moreover, even after 30 years of doing this, I still can’t imagine doing anything else with my life! But… I would be less than honest with you if I didn’t admit that there are times, every once in a great while, when this vocation of pastoral ministry starts to weigh a bit heavily on my shoulders. And these are the moments when I can be heard grumbling… aloud… to family, friends, colleagues and even the occasional church member (!) that “one of these days, I’m going to go raise sheep!” Just pick up and go, I’ll think; leave all of this behind and maybe go to Ireland, or Australia, even! Hey, it could be Wytopitlock, Maine, for all I care; just as long as there’s a flock of sheep and I could be the shepherd! I mean, think of it! 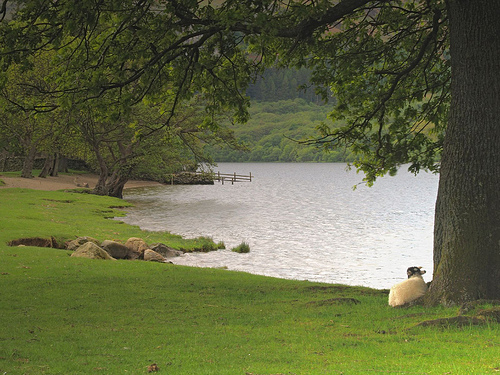 It’d be just like the Psalms; like David before me, I’d be sitting beneath a shady tree situated on a grassy hillside, cradling a tender little lamb in my arms while keeping casual watch over a flock that’s grazing along the shoreline of a fresh water pond. Just basking in the quiet; no phones, no meetings, no sermons to write, and no stress whatsoever… nothing to do all day except enjoy the sunshine and play guitar! All this, of course, is a fantasy; and it’s also, by the way, a misconception! Because if you understand anything of what it means to be a shepherd, whether in biblical times or even today, then you know it’s a profoundly life-or-death occupation. This is not a job for the faint of heart, and certainly not the best career choice for one whose primary goal is to catch 40 winks out beneath the afternoon sky! But for a “good shepherd,” Keller goes on to say, this would all be familiar; he’d know “this wild but wonderful country like the palm of his own strong hand. He would never take his flock where he had not already been before… he [would be] fully prepared to safeguard his flock and tend them with skill under every circumstance,” accepting any danger as his own, even if that means laying down his life for the sheep… for those sheep are his own. Actually, when I read that, I realize that maybe what I’m really wanting sometimes is not so much to be the shepherd, as to be the sheep! And perhaps the same holds true for you; that the real comfort that we seek comes from the one who “makes [us to] lie down in green pastures… [who] leads [us] beside still waters … [who] restores our soul;” this truly “good shepherd” who is so perfectly loving and so incredibly “care-full” that his sheep can live out their lives in safety and in peace. It’s to know love, love that is freely given and wholly demonstrated; love that’s found in simply hearing the sound of the shepherd’s voice and following. It’s everything you need or would ever want, and it’s all… wonderful! Of course, actually hearing that voice, and then recognizing it for whose it is; that’s the challenge, isn’t it? But in truth, the move to violence was misplaced, for what Jesus was saying had less to do with their faith than it did their inability or unwillingness to listen to a voice that been calling them clearly and loudly all along! Don’t you understand, Jesus was saying, haven’t you seen by now that “the Father and I are one?” And indeed, it was there all along; in works of healing and caring; in the truth of his teachings and the “wonders of his love” extended even unto the least – in this and so much more was heard the voice of the true Messiah, the one good shepherd who would lead his flock beside the still waters of hope. Even at that very moment, the Shepherd Christ calling them forward; and yet such was their anger, or their sense of propriety, or their utter lack of openness that they couldn’t, or wouldn’t, hear his voice and thus found themselves apart from the care that they truly needed. Now, reading that in John, knowing what we know about Jesus, it all seems very obvious; but I have to confess that I can understand that kind of “spiritual deafness,” if you will; and perhaps you do, too. I suspect that most of us here have, in course of our lives, have found ourselves in times and situations in which we’re literally yearning for some kind of word, any word, from God; and yet, overwhelmed by what seems to be the prevailing darkness and corruption of life, we hear nothing we recognize as being divine in nature! I mean, how many times, amidst all the tragic events of this past week, and how many people, do you suppose, were asking for some sort of sign from God? If you are the Messiah, tell us plainly! Give us a burning bush, a booming voice and bolt of lightning, or at least provide us a Damascus Road experience like that of Paul; where we get some sort of clear, unmistakable voice that will assure us that our faith is real, life is ultimately good and that evil shall not have the last word! In a world of terror, as well as in our lives of uncertainty and fear, we are not at all unlike those people at the portico of Solomon: desperately crying out from our very hearts for a shepherd who will call to us… bring us to green pastures and lead us beside the still waters… and give us the love and care we need even when we’re walking through the darkest of life’s many valleys. And yes, in the many courageous “first responders” and caregivers who rush in to boldly bring healing and life to a hurting world; and sometimes, to a desperate, seeking heart. Friends, the message here is that we need to listen… amidst the many and varied times and places of our lives and living; and often through the very people we’d least expect to hear from, we might just recognize a familiar voice, a voice we can trust and follow where it leads; which is ever and always beside still waters, that place where my soul is restored and where my life is renewed. We need not feel “apart from the flock,” because we hear the Shepherd’s voice, and as Jesus puts it, “I know them, and they follow me.” You see, whatever other uncertainties there are in this life, beloved, of this we can be certain: Christ knows who we are. He knows what we’re about; he knows our strengths and our weaknesses, and loves us because of them and despite them; and he knows the kind of dark and difficult terrain along the way that inevitably causes us to struggle. But isn’t the danger we face the reason we need a shepherd in the first place? You have always been a person to come right to the point, yet phrase it in a manner that reaches out to the very soul of the reader or listener. For years I have considered you my minister and a dear friend. It was so great to become re-acquainted with you and Lisa, and I wish we were a few miles closer. Please consider a trip to Florida and visit us for a few days. Right back at you! Thank you so much for the kind words, but most especially for your friendship…and yes, especially having just been through “mud season,” a few days in Florida sound very good!